We are proud to introduce to you the new Jesuit Volunteers joining us at Recovery Café! 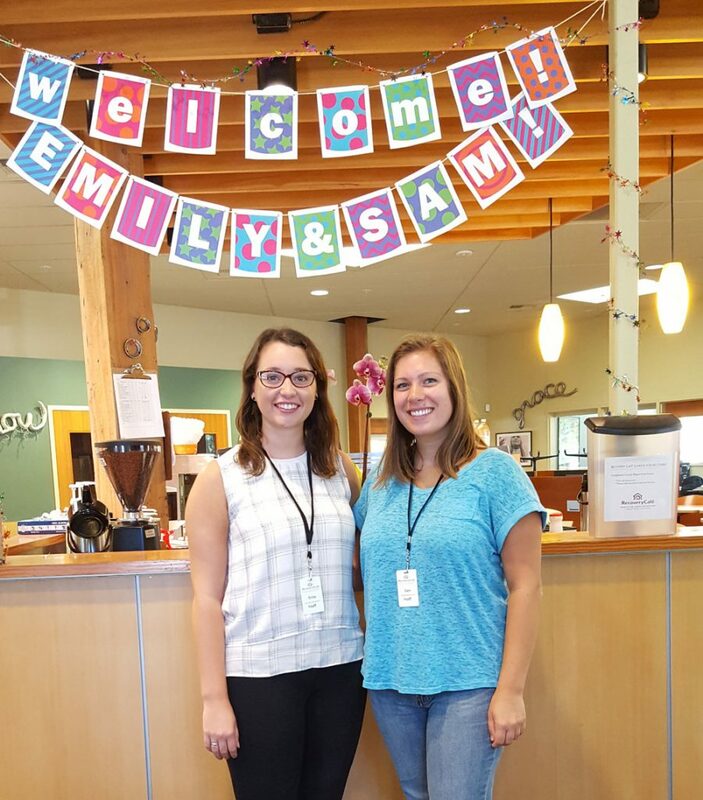 Samantha Walshak will support our operations team as Radical Hospitality Coordinator and Emily Tormey will recruit, lead and retain volunteers as Volunteer Coordinator. Both were selected for their high levels of compassion for others, integrity, and leadership abilities. We look forward to witnessing their personal growth as well as the many ways in which they will impact lasting impressions in their new roles. Numerous extracurricular activities throughout her college career inspired her to work with community service initiatives, but her participation in Saint Joseph’s Spring Break immersion program meeting the needs of underserved communities in the Appalachian region and her role as a second-grade tutor for Puentes De Salud (Bridges to Health), were exceptionally powerful drivers in her commitment to volunteer service. She treasures the opportunities she had to build lasting relationships with others and gain insight into the lives of those she’s served. If I could “be the change I wish to see in the world” I would be opening my own shelter. This shelter would be run by the members living there. They would volunteer for whatever positions were needed at that time, so we would all be working together. This is my dream that one day I could do this…Being able to spend my life in the service of others would be the ideal life for me. Attending my Jesuit University made me truly want to be a woman with and for others, and I know that is exactly what I strive to be. When focusing on social justice issues there are so many different experiences that people have surrounding these issues, and it is important to realize that all experiences are true and valid even if they seem to be contradictory. If we only take a limited view of an issue, we will never be able to understand it fully. We need to look at things like the logic, and emotions, and ideology surrounding these issues if we wish to understand it in its entirety. When Emily entered college she quickly became active in community organizations working within a framework that acknowledged a number of interconnected social problems causing disparities in access to opportunities. “I had the opportunity to volunteer at several organizations that used community organizing about specific issues to actually enact change,” Emily explained, “Although real change is not always immediate or easy, I saw that is was possible.” Emily’s first collegiate experience was participating in a pre-orientation program run by the Dorothy Day Center, where she “learned about the rich and complicated history of the Bronx and the current issues affecting the area.” Emily has been most inspired by Dorothy Day, a social justice activist, journalist, and prolific figure in the Catholic Church. She is the namesake of the Center for Service and Justice at Fordham University so through my work with the office I have gotten to learn a great deal about her life and her work. The office was very dedicated to living out her mission, and I was so inspired by the work that went on there and the legacy of social activism rooted in faith that Dorothy Day was able to create.